The Full Moon Party in Thailand is one of the most famous all night beach parties in South East Asia, if not the world. Koh Phangan is not only famous thanks to the movie The Beach, but also for the monthly party hosted on Haad Rin beach. Nearly 30,000 people come to enjoy music, fire shows, neon everything, and of course buckets of booze. When we realized we’d be arriving on the islands the day of the Full Moon Party, we decided we had to go. We looked into accommodations on Koh Phangan, but everything was either booked up, price hiked, or demanding a minimum five-day stay (which wasn’t in our plans). We did some quick research and asked a travel agent and quickly learned a really cool hack: you can stay on Koh Samui and take a $25 USD round-trip speed boat there and back. Perfect. This catch was amazing for a number of reasons. Our bungalow on Koh Samui cost only $15 a night and we had it all to ourselves. The island wasn’t rammed with drunken partiers, but still had an exceptional music and club scene. The beaches were less packed, the food was amazing, and we could keep our distance from the craziness if we wanted to. It was an all-around way better option for us. Our travel agent on Koh Samui got us a round trip speedboat trip for 800 baht, which was significantly cheaper than what was offered right at the dock. If you buy at the dock, they’re asking 1100 baht. So, try to shop around. This price included a bus from our hotel as well as the boat there, boat back, and the final bus home (note: in the early morning hours this bus ride can get pretty overloaded, so don’t rely on the ride home being straightforward). The speedboat takes about 15 minutes and everyone is cheering and stoked on life so it’s a fun trip. Oh, and skip any VIP tickets – they’re useless. Regardless of which route you pick, your ticket is good from 10pm till 7am the next day to get you home. We had read a lot of horror stories about the Full Moon Party online. So many people say it’s not safe, it’s gross, it’s just a bunch of drunken backpackers, etc. etc. We weren’t sure what to expect and I’ll admit I was a bit nervous. Conversely, we had met two other couples that went to the Full Moon Party on a whim and loved it, so we were also hoping to be pleasantly surprised. We both grabbed some potent Thai Redbulls (Google it, they’re insane) and headed over around midnight. We got to Haad Rin beach around midnight when everything was already in full swing. It was 100 baht entrance ($3 USD) and they weren’t checking any IDs (duh, it’s Thailand). We scored some free body paint that other partiers were sharing and Luke was the artist of the evening. We grabbed a flower headband, a bucket (200 baht, $6 USD for a pint of Thai rum, a Coke, and a classy plastic drinking bucket), and began to explore. The party sprawls across the entire beach. Every little bar is selling buckets, food, and playing their own music. You can hear anything from Top 40, to electro bangers, to crazy deep psytrance, to bone-shaking drum and bass. If a song comes on that you don’t like, just walk 15 feet further and enjoy the music there. We settled in for some deep house at one place, and then ventured on to some crazy fist-pumping electro the next. There is also fire everywhere. Fire dancers, fire signs, fire limbo, even fire jump rope. Luke gave that a try – the flaming 50’ rope would start swinging, people would join in and start jumping, and eventually someone would screw it all up and cause a wipeout. Untangle, clear the jump-rope area, repeat. There was a water slide, dance stages on the beach, black lights and lasers everywhere, and endless opportunities for exploring. We really enjoyed just walking around, people watching, dancing, and seeing all of the stuff offered by the island. Black lights kept the neon glowing, and stores stayed open all night (in case you forgot to bring your own neon swag). 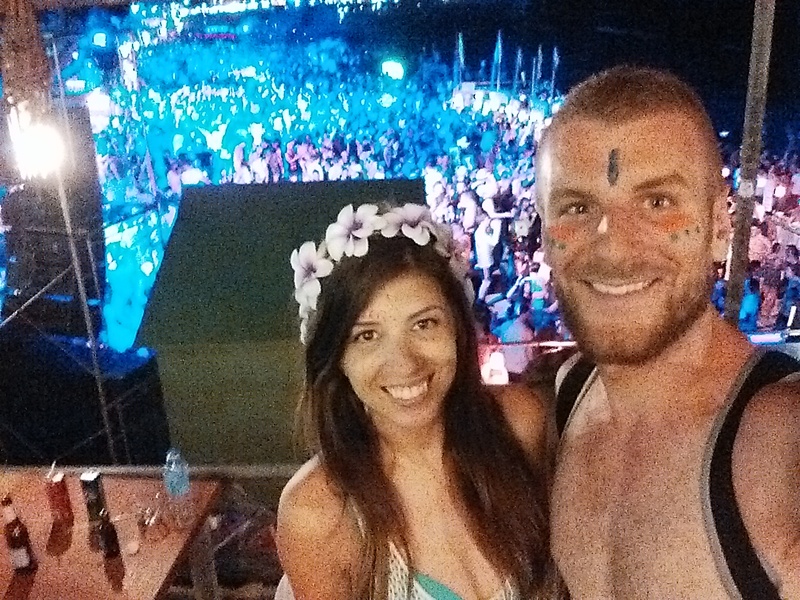 Yes, the Full Moon Party is a bit crazy. We saw drunkenness that can only be explained in terms of frosh week debauchery (including one guy dancing atop a billboard), and we saw some telltale signs of drugs. The large number of people and the short supply of public washrooms meant that hordes of bros were using the surf as a urinal. That was a bit grimy, but then again, when is a festival’s washroom setup not grimy? We just kept our heads about us, kept each other close, and kept our shoes on. Overall the Full Moon Party is a blast and the basic safety rules apply: Watch your drink, watch your bucket, don’t accept drinks or party favors from strangers, take a buddy (and WATCH your buddy … too many girls were on the solo on the hunt for their lost BFF), don’t sleep on the beach, watch your stuff for pickpockets, try not to get blackout drunk, and WEAR SOMETHING GOOD ON YOUR FEET. Broken glass in the sand leaves a lot of backpackers hobbling for the rest of their trip. In the end, it was one of the most memorable nights of our trip. Before we knew it, it was 4AM and we were grabbing chicken shwarma in preparation for battling the long line to get back on our speedboat. If you’re ever in Thailand around a Full Moon Party date, I cannot urge you enough to leave all of your inhibitions behind, grab a neon tank top, and just GO. Getting to the islands in the South of Thailand was probably one of the most exciting parts of our trip. We had heard such great things about the beautiful beaches, the laid back atmosphere, and of course, the parties. In our last blog entry we mentioned that we’re huge fans of techno and house music, and getting to the islands where we could feed our hunger for the music we love was beyond exciting. We spotted a flyer in Bangkok saying that the legendary Sven Väth was playing on Koh Samui, so we made sure to time our travels accordingly. 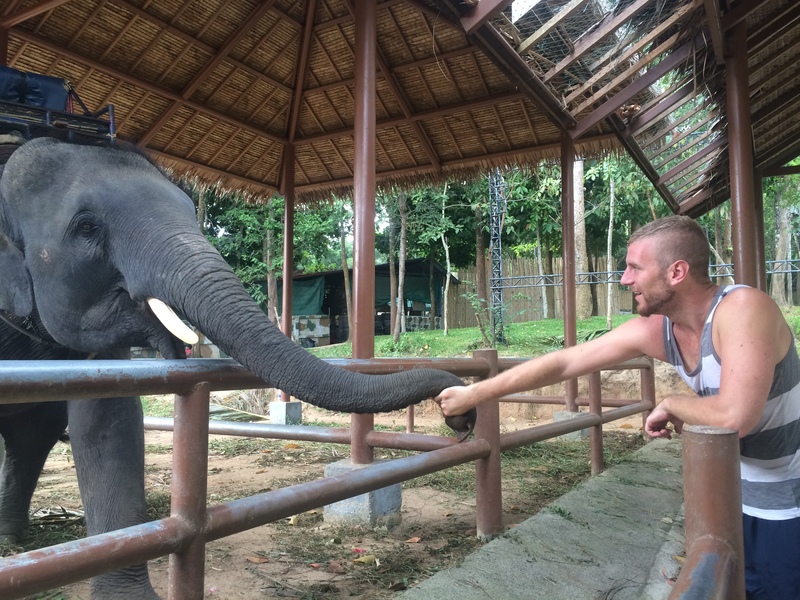 Luke even made a new elephant friend. We decided to opt for a private bungalow to enjoy the island life for six nights. We found a gorgeous place just off the main drag of Chaweng Beach for $15 a night (Pattara House, we highly recommend it), which by Samui standards was excellently priced. Shortly after checking in, we met a kind local lady who became our travel agent, bike rental dealer, restaurant recommender, and currency exchange all in one. We were set for the island! I can’t help but gush when I talk about Koh Samui. My heart actually aches missing the island. I don’t even know where to begin with all the incredible things we did and memories we made. While prices are a tad bit higher on the island, as it’s a vacation destination for a lot of Europeans (it has its own airport, too), there are still so many markets and cheap restaurants available with amazing food. The beaches are also unique and plentiful, from busy central beaches to more secluded options. The club scene was far more than we expected. Since there’s heavy European traffic, the music scene is proper and everywhere. The clubs are upscale but also free entry, due to the heavy competition, and I’d say they cater to a more mature crowd (which is a nice change). We visited Sound Hotel, as they were hosting a free deep house night with James Trystan, and for a grand total of $15 we got to smoke hookah in a fancy club by a pool bar. Later on in the week we visited many of the beachfront clubs offering excellent music and fire shows. 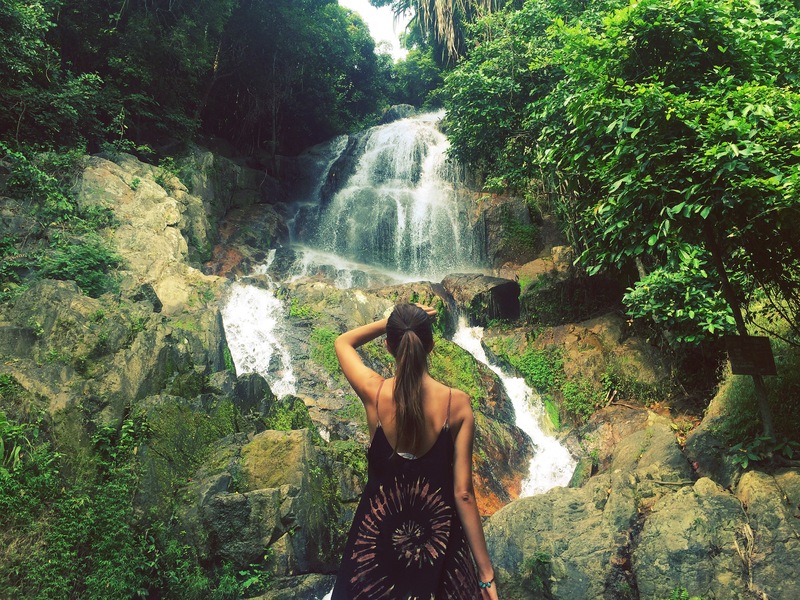 During the days, we enjoyed motorbiking around the island, exploring coffee shops, tanning on the beaches, and hiking to find the most beautiful waterfall we’ve seen this trip. Hin Lad waterfall is majestic and easy to find. It’s a must see if you’re on the island and a great spot for bringing a packed lunch and going for a swim. We also visited the Big Buddha and the Wat on the hill, as well as the Bophut Fisherman Village’s market on Friday night. The Fisherman’s Village was notable for having the most original wares of all the night markets we’ve visited. We got to try sautéed garlic oysters for a dollar! 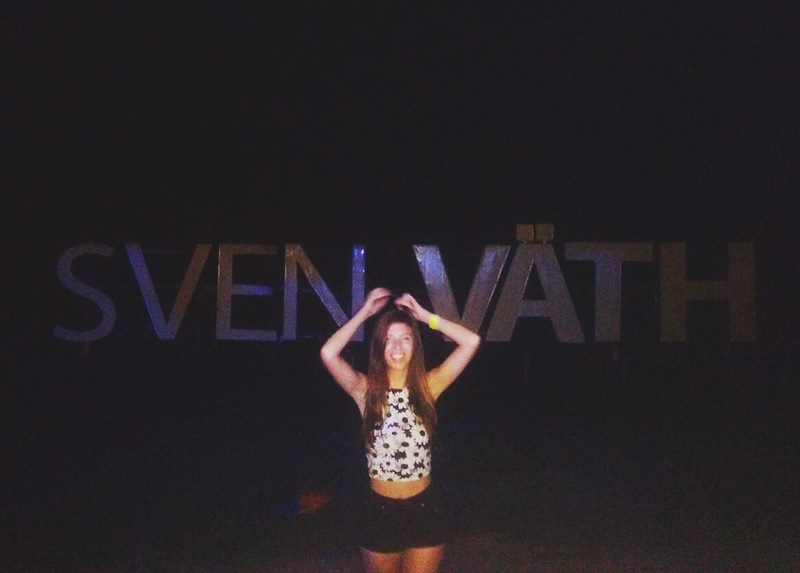 Finally, Saturday night rolled around and we left for Cha Cha Moon Beach Club to see Sven Väth. Nakadia opened with another perfectly deep set, and Sven Väth followed with an unbelievably rich four hours of sweet, sweet techno. We danced on the beach until our feet hurt, only taking a break to eat a Nutella-banana crepe that Luke snagged from a beach vendor. Being on this beautiful Thai island, dancing to some of the best techno I’ve heard in my life, with my feet half in the sand and half in the ocean… it was truly an evening we both will never forget. Arriving in Bangkok for the second time during our trip, we vowed to do things differently. For starters, we were dying to hear some decent music. For anyone that doesn’t know us — we are massive electronic music fans. Having traveled over much of North America to music festivals and having lived in Toronto, a city blessed with a rich electronic music scene, it’s been far too long since we’ve heard the thumping bass of techno and house music pounding through speakers. We knew Bangkok was the solution to our dilemma. On our last trip to Bangkok we stuck to Khao San Road and the wats, but consequently found ourselves surrounded by backpackers at all times. This time around we left the hostel region behind and explored some of Bangkok’s darker side — both the good and bad. 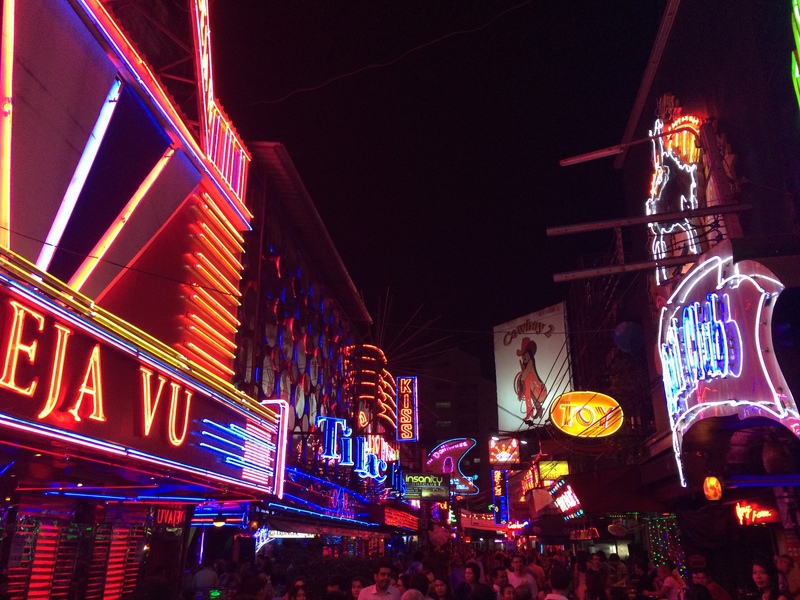 Many of Bangkok’s clubs were in the Sukhumvit neighbourhood, also home to the infamous Soi Cowboy and red light district. We decided to check things out for ourselves. Nakadia, a Berlin techno/house DJ, was playing at GLOW Club Bangkok, so we drank some Red Bull and hobbled over to the entertainment district for some much needed dancing. On the way, we wanted to see what the fuss was all about in the red light district (sorry mom and dad, stop reading now!). The red light district in Bangkok is full of neon lights and girls in barely any clothes trying to get people to come into their respective clubs. It felt a lot like walking through a packed shopping mall, except half of the people you were passing were scantily clad Thai girls and the displays were dancing on poles. The shoppers? Older white men hoping to find the loves of their life and naive, but excited, young backpackers not knowing their wallet was about to be emptied. We managed to get through Soi Cowboy relatively unscathed, save a few dirty looks. Five minutes later, we arrived at GLOW Club. The club is small but it made for an intimate atmosphere. 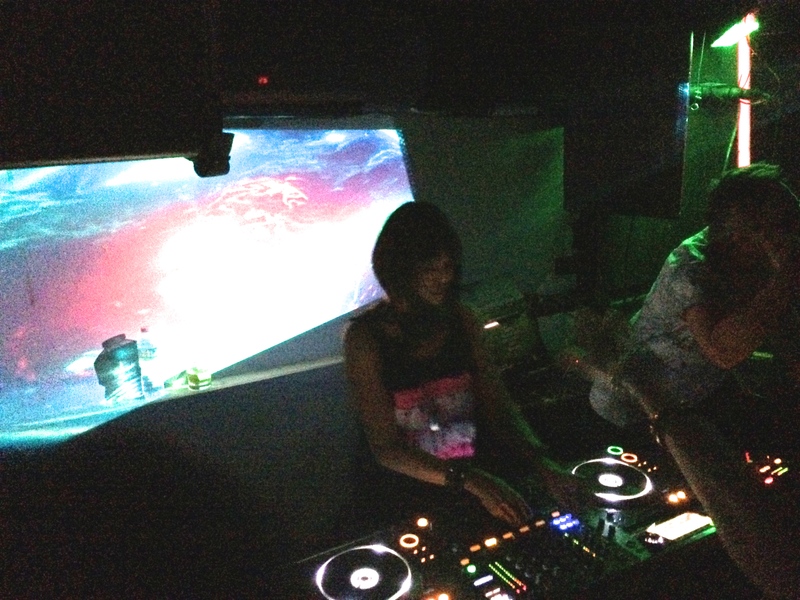 When Nakadia came on, fans were cheering and reaching for handshakes over the DJ booth. She was smiling and bumping to the beat, happy to be playing for everyone. Her set was everything we hoped for and it felt so good to just dance with a crowd of people who were truly into the music, expats and locals alike. We left just after 2AM and started the walk home. We got dropped off near Khao San Road and unfortunately, the scene there wasn’t nearly as pleasant. Backpackers with buckets of booze were throwing up on the street, hobbling home, and some had shirts off fist bumping to country music. We grabbed a crepe and made a mad dash for our hotel. The night life in Bangkok definitely has something for everyone. The clubs are proper and if you want a taste of real nightlife, stay away from the backpacker haunts and dress up for the clubs.